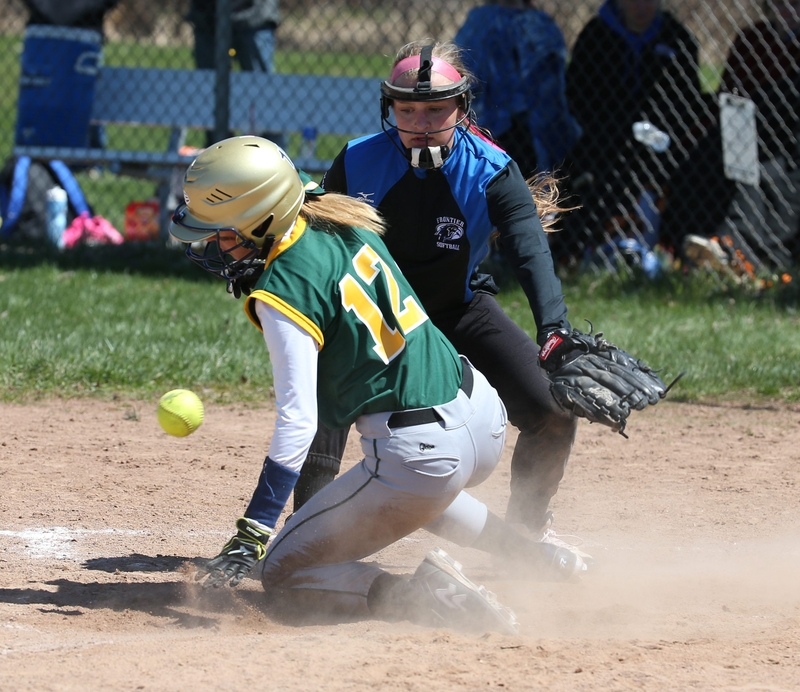 West Seneca East’s Brittany Nowatzki slides home safely as Frontier’s Oliva Nappo tries to apply the tag in the sixth inning of their game in the Depew Wildcat softball tournament. For one day, at least, West Seneca rules the local high school softball world. West Seneca East and West Seneca West each won bracket championships and went 3-0 Saturday in the Depew Wildcat Tournament at Walden Pond in Lancaster. Bracket MVP Mandy Manquen, a junior transfer from Mount Mercy, pitched a three-hitter for East in a 3-0 victory over Clarence in the A Bracket championship. Earlier, Manquen pitched a 6-5 victory over Frontier, a game in which the Trojans rallied from a 5-1 deficit. East also defeated Sacred Heart, 7-6, after trailing, 5-0. Maddie Jazscz, who was a defensive standout in center field all day, drove in two runs for the Trojans (5-1) in the championship game. West Seneca West (6-3) also got shutout pitching in its 5-0 triumph over host Depew in the B Bracket final. MVP Brianna Chambers gave up six hits and walked one but struck out eight as she pitched out of difficulty, leaving two runners on base in each of the last three innings. Chambers also pitched West’s 5-4 victory over Fredonia and went 2 for 3 with an RBI. Val Caballero pitched a two-hitter in West’s 6-2 win over Alden. Sophomore second baseman Abby Hoesterman also made the All-Tournament team. “She had a double in the Depew game and a single against Fredonia and played fantastic defense,” said West Seneca West coach Lori Potter. How did the winners celebrate? “We’re going to Lasertron for a little team bonding” said West Seneca East coach Rich Mattison. “We went for ice cream,” said West Seneca West’s Potter. McKyla Brooks of Frontier established a Section VI record in the girls triple jump Saturday when she cleared 39 feet, 8 inches in the event at the Dunkirk Track & Field Invitational. Brooks was named the MVP for field events. Emilee Hanlon of Dunkirk was MVP for track events after she won the 200 and high jump. Jamie Guadagno, who helped Orchard Park to the boys team title, was MVP of that meet after he anchored the Quakers’ winning 4x100 relay and finished second in the 100 and the long jump. Ryan Williams, who pitched a no-hit game for Kenmore East on Tuesday, combined with Dylan Creasey on a three-hitter on Saturday in a 7-1 victory over Kenmore West. Williams, a junior, had thrown 115 pitches in his no-hitter. Bam Ruggiero, Luke Simmons, Nick Lobocchiaro and Conor Hoar each drove in a run for East, which broke the game open with a four-run fourth inning. The return game will be May 8 under the lights at Sheridan Park.